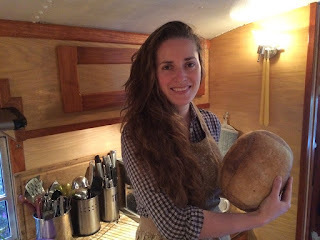 Julie just wrapped filming her homemade sourdough bread tutorial. The bread was made fresh right here in the Good News Bus. If this is something you would enjoy seeing let us know in the comment section below. We should have the video available in the coming weeks! I'm interested in the oven size, pan size. It seems like it would be difficult to bake bread in an RV oven. Oh yes I hope there is a video for this!